The professionals at Premiere Pros are well-trained interior painters that do the job for you quickly, easily and with outstanding results. We use the latest technology in paints that are environmentally safe and of the highest quality. Interior painting is also the most cost effective and quickest home improvement project. The advantage of having your house done by a professional is the experience, skill and expertise needed to make the interior of your home look amazing. You can transform the look of a room with just a quick color change. The key is knowing which interior paint colors are right for your home and in which color combinations will work best. Instead of choosing safe and conventional colors, let us help you choose the right color combinations for your home’s architectural design. Whether you are looking to bring a warm and cozy feel to a room, or a dazzling burst of color, we will help bring your ideas to life. We also offer color consultations, faux finishes and murals. Premiere Pros proudly serves the South Shore of MA (Massachusetts), including the towns of Braintree, Milton, Abington, Quincy, Hanover, Hingham, Weymouth, Norwell, Scituate and Cohasset. 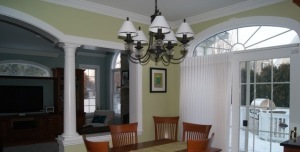 Call 781-849-0078 or fill out the contact form to the right for a free estimate on your next interior painting project.